Bodies of the teenagers, missing since June 12, were discovered. The Israeli Air Force carried out what it called "precision strikes" on 34 "terror targets" in the Gaza Strip overnight, and a Palestinian from the group Hamas was shot dead when he threw a grenade at forces carrying out an arrest raid, as tensions soared after the discovery of the bodies of three Israeli teenagers who were kidnapped in the West Bank earlier in June. The man killed Tuesday was the first casualty since the bodies were found. The Israeli Defense Forces said the strikes were in response to rockets being launched earlier into Israel from Gaza. The waves of rockets from Gaza and IDF retaliations have picked up since the teens were kidnapped and the Israeli crackdown began. (Spencer Platt/Getty Images) People gather for a vigil for the three Israeli teens outside of the Israeli Consulate on June 16, 2014 in New York City. Hamas has not claimed responsibility for launching the rockets but Israel holds them responsible for everything coming out of Gaza. The Israel Defense Forces also tweeted early Tuesday morning that a rocket was fired from Gaza into Israel, but no damage was reported. The discovery of the bodies drew a strong rebuke from Israeli Prime Minister Benjamin Netanyahu Monday as he convened an emergency meeting of his Security Council. "With heavy grief, this evening we found three bodies. 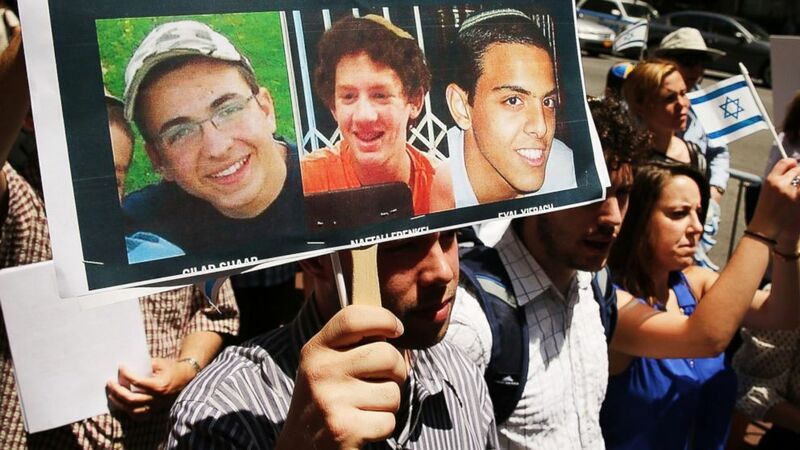 All signs indicate that they are the bodies of our three abducted youths -- Eyal Yifrach, Gilad Shaar and Naftali Frankel," Netanyahu said before the start of an emergency cabinet meeting. A short time later, he said in a statement: "Hamas is responsible, and Hamas will pay." "They were abducted and murdered in cold blood by human animals. On behalf of the entire Jewish people, I would like to tell the dear families –- the mothers, fathers, grandmothers and grandfathers, and brothers and sisters –- we are deeply saddened, the entire nation weeps with you. We will give the boys a proper burial," Netanyahu said. Then the prime minister quoted Israeli poet Hayim Nahman Bialik. "'Vengeance for the blood of a small child, Satan has not yet created,'" he said. "[N]either has vengeance for the blood of three pure youths, who were on their way home to meet their parents, who will not see them anymore ... May the memories of the three boys be blessed." 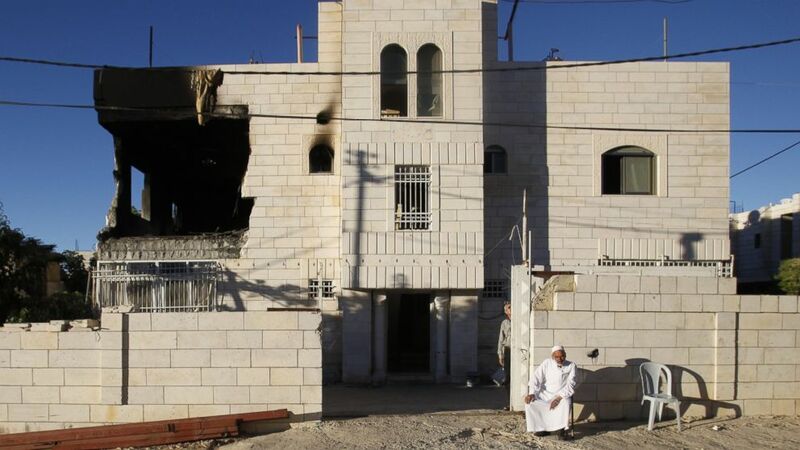 (Nasser Shiyoukhi/AP Photo) A Palestinian sits outside a home damaged by the Israeli army in the West Bank city of Hebron, July 1, 2014. There were reports that Israeli soldiers had already been deployed in Hebron, where the teens went missing on June 12, and Israeli TV stations showed pictures of soldiers moving through the village of Halhul, just north of Hebron. Hamas spokesman Sami Abu Zuhri said in a statement Monday night: "Only the Israeli version of the events has been published. Israel is attempting to make way for aggression against us, against Hamas. We reject all Israeli allegations and threats against us. We are already used to it and will know how to defend ourselves. No Palestinian group, Hamas or any other group, has taken responsibility for the action, and thus the Israeli version can't be trusted." Hamas had warned that waging war on the Gaza Strip would "open the gates of hell" on Israel.